BURBANK, CA – Eric Lee is one of the most notable pioneers in the martial arts industry. It was Lee that changed history by being one of the first and most successful forms and weapons competitor in the nation. In a time when only Karate practitioners took part in martial arts tournaments, Lee stepped onto the mat and became one of the greatest competitors of all time. The Martial Arts History Museum is proud to present a screening on Eric Lee's life this Saturday, October 10 at 6 pm. “Eric Lee was by far one of the most popular and greatest competitors in history. 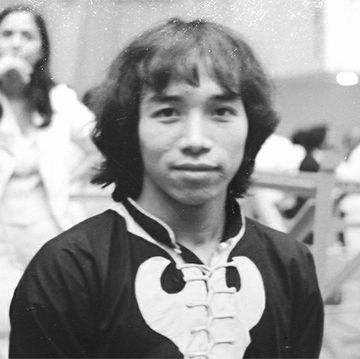 He opened the doors to Kung Fu into tournaments which were completely dominated by Karate. In a sea of white uniforms, one small stylist in a black cotton uniform changed the world,” says Michael Matsuda, museum president. This Biography screening of Eric Lee's life consists of old footage, historical achievements, interviews from some of the martial arts Hall of Famers which will conclude with a Q & A from Eric Lee himself. The Biography movie will start at 6 pm and is a free event to the public. In addition to the film, at 5 pm, the Museum will be unveiling a variety of new artifacts to be put on display. Beginning with the Flying Guillotine Display as the cast and crew of the movie Samurai Cop 2, will do the unveiling. The Museum will also be unveiling UFC fighter Chuck “the iceman” Liddell's fighting shorts for all to enjoy. In the spirit of Walt Disney, the Museum will be unveiling the first animatronic talking head made to resemble Lo Pan from the film, “Big Trouble in Little China.” The item was designed by Emmy Award winner Paul Wee and Halloween designer Bill Webber. The unveiling will begin at 5 pm prior to the biography film the Martial Arts History Museum and is a FREE EVENT for all to enjoy. The Museum is located at 2319 W. Magnolia Blvd. in Burbank, CA.